Probably the most controversial thing about the blogging service Tumblr is that it doesn’t have a built-in way to comment on posts. You sort of can do it now if you reblog an item and add your own note (which then shows up under the original post), but it’s not the same. And while they still haven’t added comments, tonight they’ve temporarily turned on a new feature: Photo Replies. While it doesn’t appear the feature is working just yet, Tumblr notes that they’re going to turn it on for the next 48 hours as an experiment. 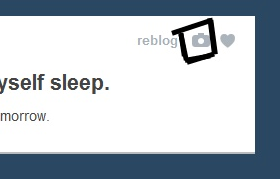 When it is on, you will presumably see a new photo icon in your dashboard which will allow you to upload a picture in response to a Tumblr post. So yes, basically it’s a photo comment. 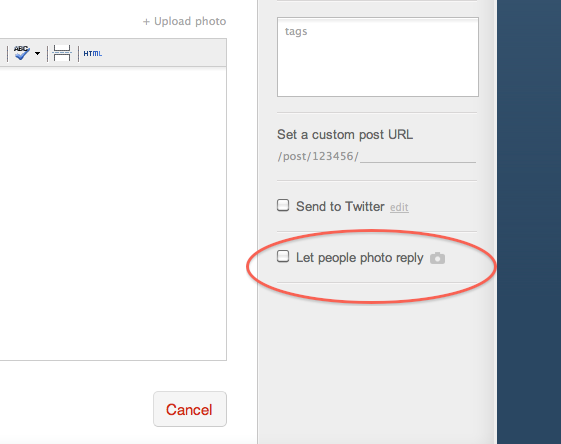 To enable it on any post, simply check the box that reads “Let people photo reply” in the Tumblr backend for your blog. While Tumblr itself doesn’t have a native commenting system, many users choose a third-party commenting option. The Tumblr Staff Blog, for example, uses Disqus.